The state of North Carolina has basic laws that landlords must follow when it comes to the security deposit. If you do not follow the correct rules, you may forfeit your right to keep a tenant’s security deposit. Here are the basic security deposit guidelines every landlord in North Carolina must understand and follow. The maximum amount you can charge as a security deposit in North Carolina depends on the length of tenancy. For Week to Week Tenants: The maximum amount you can charge is two weeks’ rent. For Month to Month Tenants: The maximum amount you can charge is one and a half month’s rent. For Anything Longer than Month to Month Tenants: The maximum amount you can charge is two months’ rent. Pet Deposit: Landlords in North Carolina who have pet-friendly properties can also charge tenant’s a “reasonable, nonrefundable” pet deposit. A landlord in North Carolina normally has 30 days after tenant move-out to return a tenant’s security deposit, by mail or in person. If the landlord is not able to accurately calculate the charges within the 30-day window, the landlord has 60 days to return the deposit or the balance of the deposit to the tenant. Even if the landlord does have 60 days to return the deposit, the landlord must still provide the tenant with an estimate of charges within 30 days of tenant move-out. Written Itemized List: Along with the balance of the security deposit, the landlord must also provide an itemized list of damages or deductions. A tenant can file suit against a landlord if the landlord has not followed the proper procedures as spelled out in North Carolina's Tenant Security Deposit Act. Forwarding Address: If the tenant has not provided the landlord with a forwarding address, the landlord is allowed to make their legal deductions from the security deposit after 30 days and must retain the remaining portion of the deposit for six months for the tenant to collect. Trust Account: The account must be in a licensed and insured bank or financial institution which is located in North Carolina. Bond: A landlord can elect to post a bond for the amount of the security deposit. The bond must be issued by an insurance company which has a business license in North Carolina. If the landlord posts a bond for the amount of the security deposit in the state of North Carolina, they are then free to keep the security deposits in a trust account outside of the state if they choose. Within 30 days of receiving the security deposit, the landlord must notify the tenant of the name and address of the bank or financial institution where the deposit is being held or the insurance company that posted the bond. A walk through inspection is not required in the state of North Carolina. Transfer the security deposit, minus any lawful deductions, to the new owner. You must also notify the tenant in writing by mail of the transfer along with the name and address of the new owner. Return the security deposit, minus any lawful deductions, to the tenant. 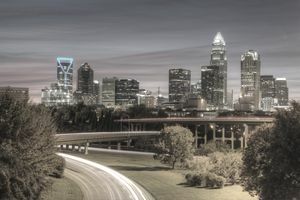 What Is North Carolina's Security Deposit Law?